Two standard sizes of biscuits. Very simple controls and adjustments. Great cuts. Only complaint is how often you just empty the sawdust bag or ithe exhaust vent will clog up. Quality biscuits. No pieces or parts like some no brand biscuits. Great biscuits. Work well with my Craftsman biscuit jointer. The biscuits are consistently uniform, no rejects. I have been doing woodworking for over 30 years. 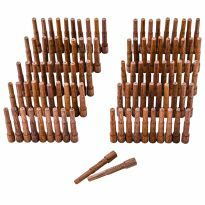 I started out using nothing but dowels. Like everything else they have there place. When I first saw the biscuits I was very sceptacle but I checked it out. I am glad I did. Most of my projects are made with used lumber so I need to make my boards to what ever width I need. I still use dowels in certain places but biscuits are my main choice for joinery. Good fit, works as supposed to! What do you want to know? They're biscuits. The align, swell, and do their job. The price was right and since I'm a fan of biscuit joinery - I'll continue to buy them. Not a single one of them was damaged - buy 'em . . . use 'em . . . and continue to trust Rockler for their quality. In putting together panels, supporting members or shelves, I find biscuits an invaluable part of construction. The latest project I used the bisquits for was a custom reception desk in a veterinary hospital. I used them to asseble the work top which had odd shaped miters over 24 inches. I use biscuits anytime I can get the cutter in place. 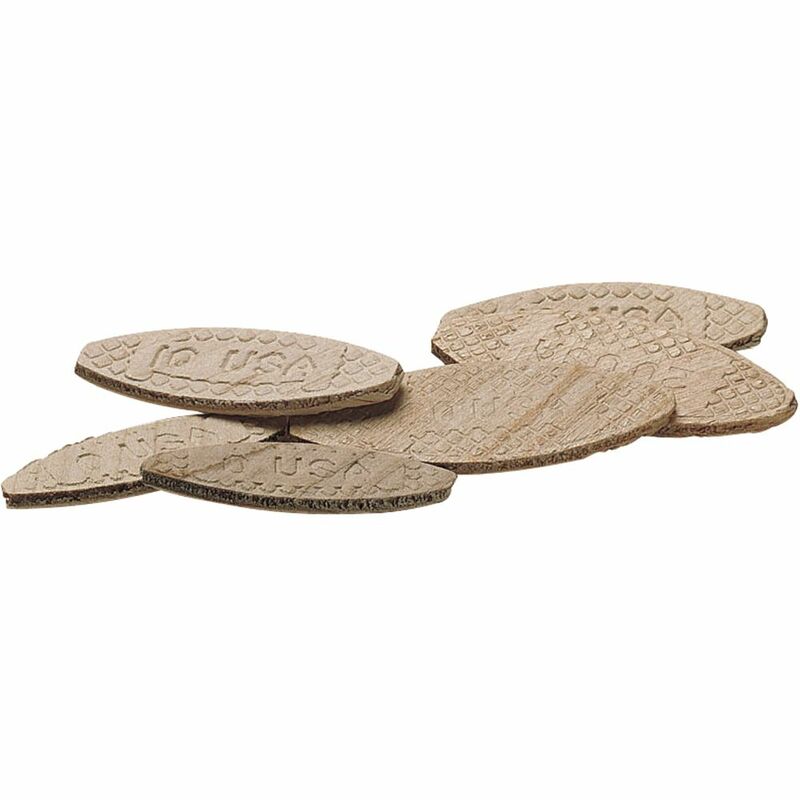 I'm using the biscuits along with Titebond III wood glue to put hardwood floors in my home. The wood I'm using are not tongue and groove so the biscuits provide a strong even joint. They also afford a great flexibility of design like the 3d star at the entry to the living room. The box I received was Porter Cable brand. I've noticed very few damaged biscuits - none I couldn't use. 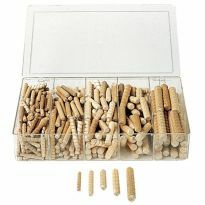 This assorted set was the most economical I found for general, good quality biscuits. I am the Biscuit Queen. Need more buscuits!! Can't get enough of these little guys to join stuff together. Forget about dove tails, tongue and groove, rails, phht! Give me biscuits in a pinch anytime! Inconsistent thickness allows for occasional unevenness of the surface of the panel- certainly useful for large panels that are difficult to glue up. All biscuits seem to be of good quality and all are useable. This was my first experience using biscuits and I was very pleased with the results. I had a couple of large 45 deg mitred corners to join on a fireplace hearth and 2 biscuits on each corner worked very well in this application and gave a very secure joint. I will defintely be using biscuits more often! One note - the Rockler biscuit cutter set also worked very well but don't waste your money on the gauge since the dimensions on the gauge aren't even correct. Meaure the length of cut using a biscuit. Good quality, and no broken pieces. One minor ask is that they come in a resealable bag. They are biscuits. 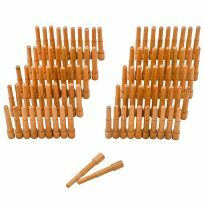 Ordinarily not too much to say but I did have quite a few more boken biscuits than normal. I always thought there was probably one or two companies making biscuits who wholesaled them to different companies to package as their brand. I no longer believe that. I've been using biscuit joints for 20+ years and have always bought the name brands at the big stores. I had a project that was going to require several hundred biscuits and I noticed at Rockler one day they were sold in bags of 250 and 1000 so I jumped on 'em. Once I began using them, I noticed a vast difference in quality for their store brand. The thickness varied greatly, some were so tight I had to mallet them in and some were so loose that they could be moved around in the slot thickness wise. A lot of them, the sides would flake off as I was putting them in and some of them broke so I would have to stop in the middle of the glue up and extract/replace them. Of course I used them anyway since I had paid for them, but they made a usually simple process aggravating and more time consuming. Because of the quality, I'm mildly concerned about them breaking in the joint. I will go back to the established brands in the future who seem to have some quality control. Excess of gravy on hand so I thought a nice supply of biscuits would be a good complement. Picked up some bench cookies for dessert! used for several years and i am starting a big project. Needed more biscuits, and sale price was great. 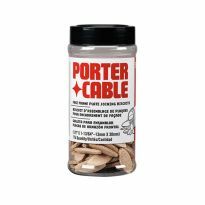 Porter Cable is always the best! I like to use the biscuits when edge joining table top planks and some other box joints. They are the only ones that work well. Good product. Needed biscuits to build a cold frame. restock to work with Porter-Cable biscuit joiner. Other brands did not fit in the slot. I make a lot of signs, so I do a lot of glue ups. the biscuits give me a little more confidence that it will stay together. Easier to order using the same order even though I could have bought from other venders for about half the price. I love using biscuit joinery. It's useful for gluing boards together to make table tops and for adding a piece of wood to finish the edge of plywood. Although I purchased a biscuit slot cutting tool, I have discovered using a router table with a biscuit slot bit makes the job easier. I am running out of the 20 size. To use in constructing heirloom bookcases. Thickness of a #20 biscuit? how thick is a #10 biscuit for the correct slot cutter? BEST ANSWER: Slot thickness for all biscuits is 5/32"